Jill Stier is an Assistant Professor and Graduate Coordinator in the Department of Occupational Science and Occupational Therapy. Jill’s role as the Graduate Coordinator involves the coordination of services and programs which affect several aspects of student life. Jill chairs the Student Affairs Committee which is responsible for admissions and awards, recruitment, student advising, academic performance including marks and the appeals process, student bursaries and scholarships. Jill has expertise with accessibility and accommodation strategies for graduate students. Jill had many years of clinical experience working with individuals of all ages and had a special interest in the area of hand and burn rehabilitation. Jill has always had a passion for education and knowledge transfer which was evident in her past role as a Fieldwork Coordinator in the Department of Occupational Science and Occupational Therapy. 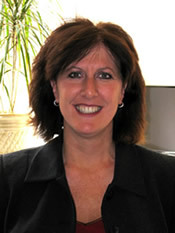 Jill’s past experience has also included her leadership position as Director of Professional Development and Practice Support with the Ontario Society of Occupational Therapists (OSOT) where she applied knowledge transfer theory in the development, implementation and evaluation of OSOT’s professional development services. Stier, J., Barker, D., & Campbell-Rempel, M. (2015, May/June). Student accommodations in occupational therapy university programs: Requirements, present environment and trends. Occupational Therapy Now, 17(3). Barker, D. & Stier, J. (Eds.). (2014, March). Checklist for consideration of student accessibility when teaching outside the classroom. Toronto: Council of Ontario Universities. Bossers, A., Drynan, D., Gallagher, M.B., O’Sullivan, C., Polatajko, H., Slade, A., Stier, J., … Holmes, J. (2010). 1000 hours of fieldwork? Analysis of multi-site evidence. Canadian Journal of Occupational Therapy, 77(3), 135-143. Stier, J. & Smordin, H. (2008). Importance and significance of occupation in the lives of older adults: An examination of Syd’s group. Occupational Therapy Now, 6(2), 23-25. Stier, J. (2004). Occupation-based splinting. Occupational Therapy Now, 6(4), 19-21. Tam, J., MScOT Candidate, & Singh, H., MScOT Candidate, University of Toronto. Program Evaluation of the AccessTO Initiative: Exploring the factors influencing awareness and usability for adults with physical disabilities. 2015/16 (Co-Supervised- In Progress). Kyle, G., MScOT Candidate, & Suthers, K., MScOT Candidate, University of Toronto. Examining Retirement Planning Programs: A Scoping Review. 2015/16 (Co-Supervised- In Progress). Ly, A., MScOT, & Fong, C., MScOT Candidate, University of Toronto. Pilot Testing a Fieldwork Demands Measure for Occupational Therapy Placements. 2013/2014 (Co- Supervised). Lo, K., MScOT Candidate, & Yang, J., MScOT, University of Toronto. Development of an Occupational Demands Measure for Occupational Therapy Fieldwork Placement. 2012/2013 (Co-Supervised). MacKinnon, C., MScOT, & Asher, S., MScOT, University of Toronto. Enhance our Profession: Bring in the Best Occupational Therapy Students. 2011/2012 (Co-Supervised). Leung, J., MScOT, & Pirapakaran, P., MScOT, University of Toronto. Occupational Repertoires of Older Adults in a Community-Based Group. 2010/2011 (Co- Supervised). Lipszc, D., MScOT, University of Toronto. Development and Pilot Testing of a Master of Science in Occupational Therapy (MScOT) Written Submission Measure. 2009/2010 (Co- Supervised). Fung, V., MScOT, University of Toronto. The Use of Admission Criteria to Predict Academic and Clinical Performance in Masters of Occupational Therapy Programs. 2008/2009 (Co- Supervised). Graduate admissions, educational assessments, student accommodations, evaluation tools, diversity and inclusion, clinical skills using simulated clients. Stier, J., Nelles, L.M., Ng, S., & Walsh, C.M. (2015, October 23). Using performance techniques in health professions education as a means to enhance communication skills. Presented at the Richard Reznick Wilson Center Research Day, Toronto, ON. Stier, J. & Kulman-Lipsey, S. (2015, May). Building resilient occupational therapy students. Presented at the annual conference of the Canadian Association of Occupational Therapists, Winnipeg, MB. Trentham, B., Stier, J., Cockburn, L., Cameron, D., Fourt, A., Langlois, S., Renwick, R., & Sangrar, R. (2015, May 28). OT student experience of diversity and inclusion curriculum. Presented at the annual conference of the Canadian Association of Occupational Therapists, Winnipeg, MB. Barker, D., Lencucha, J., & Stier, J. (2014). Kolb’s Learning Cycle as a foundation for early fieldwork learning. Poster presented at the annual conference of the Canadian Association of Occupational Therapists, Fredericton, NB. Ly, A., Fong, C., Barker, D., & Stier, J. (2014, September 19). Pilot testing a fieldwork demands measure for occupational therapy placements. Presentation made at the annual conference of the Ontario Society of Occupational Therapists, Richmond Hill, ON.